Today, we are extremely pleased to announce the release of MongoBooster 4.0. This major upgrade includes Query MongoDB with SQL, ES7 Async/Await support and more. With MongoBooster V4, you can run SQL SELECT Query against MongoDB. 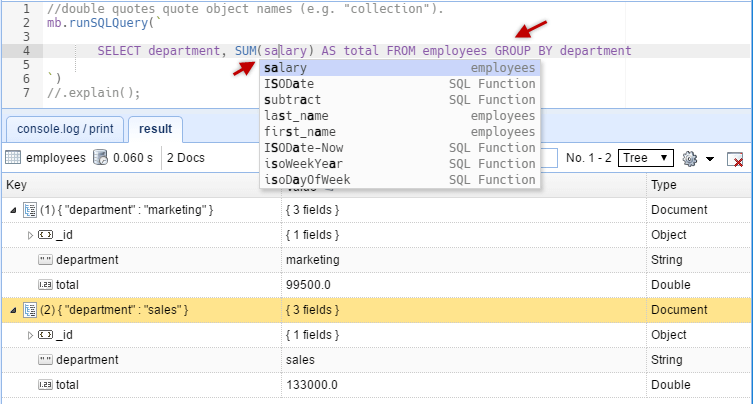 SQL support includes functions, expressions, aggregation for collections with nested objects and arrays. Let’s look at how to use the GROUP BY clause with the SUM function in SQL. Open a shell tab, enter the above script. 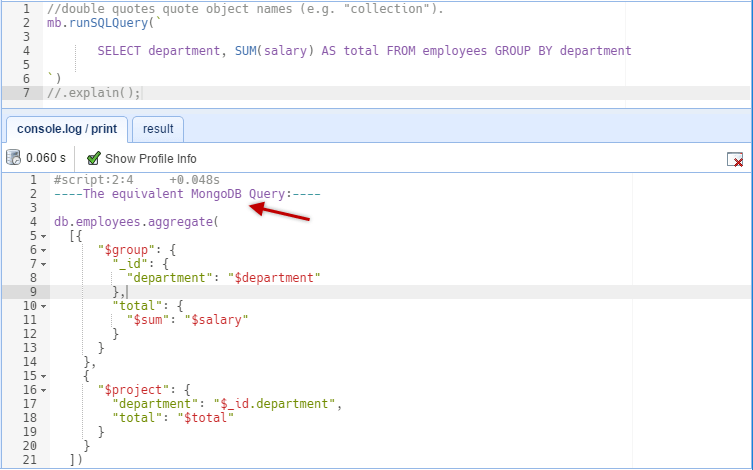 MongoBooster also offers a “runSQLQuery” code snippets. Just type a snippet prefix “run”, and enter “tab” to insert this snippet, then press “Command-Enter” to execute it and get the result. The build-in SQL language service knows all possible completions, SQL functions, keywords, MongoDB collection names and field names. The IntelliSense suggestions will pop up as you type. You can always manually trigger the auto-complete feature with Ctrl-Shift-Space. MongoBooster supports in-place editing in result tree view. Double-click on any value or array element to edit. Pressing shortcut “Esc” will return the previous value and exit the editor. If you want the results not to be edited directly, you can enable the “read-only” mode by clicking the lock button in the toolbar. SQL features are not natively supported by MongoDB. The SQL query is validated and translated into a MongoDB query and executed by MongoBooster. The Equivalent MongoDB Query can be viewed in console.log tab. See the features and SQL examples supported by the MongoBooster. Within this release, we have also added support for ES7 Async/Await in MongoBooster shell. As a comparison， MongoBooster has a build-in function await which is a common js method, not a keyword. It can await a promise or a promise array. Note this await function is different from es7 await, this await function may be used in functions without the async keyword marked. The above example can be written with the MongoBooster await function. MongoBooser integrates node-fetch to bring window.fetch to MongoDB Script. The cursor.not(operator-expression) method performs a logical NOT operation on the specified “operator-expression” and selects the documents that do not match the “operator-expression”. This includes documents that do not contain the field. The query will select all documents in the inventory collection where the item field value does not start with the letter p.
The cursor.type( BSON type number | String alias ) method selects the documents where the value of the field is an instance of the specified BSON type. Querying by data type is useful when dealing with highly unstructured data where data types are not predictable. In the previous version, only up to 30 scripts can be saved. We got feedback from users, they say this value is too small. In the new version, we allow to save up to 1000 history scripts. Histrory entries can be grouped by date, which is easier to retrieve and query. Added, add “stop script”, “pause log” and “clear-log” buttons to the run-time log dialog. Improved, Linux: Add category entry “Development” to the *.desktop file. Improved, Limit the maximum number of the run-tim log records to 10,000.